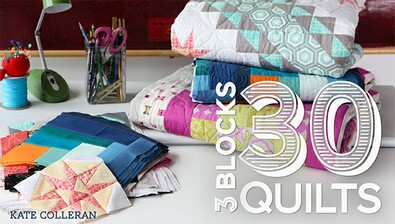 Unlock the creative power of three approachable blocks to create remarkable projects with quilt designer Kate Colleran. Get tips for choosing fabrics, strip piecing, pressing and more. Then showcase favorite fabrics in a modified log cabin block made with strips of all different sizes. Sew a second block featuring a four-patch that creates settings with vibrant interplay between blocks. For the most dramatic block yet, combine half- and quarter-square triangles, trapezoids and star points. Discover 10 unique settings for each of these blocks -- and make them your own! Blend beautiful colors with hand- picked patterns for one-block quilts with all the visual interest and movement you strive for.